Once you start making your quilts I’m sure you want to learn more about this beautiful art. Once you become a quilter, you want just to keep making more quilts, it doesn’t matter how big or small they are, you just want to make them all, mini, small, medium and big quilts even king size quilts. This is why you will never get bored of making quilts, there are so many to make and each one of them so pretty you just want to make them all. What is a Journal Quilt? When I learned about making quilts, yes I know “it was a long time ago”, we, quilters just had quilts magazines to read about quilts, quilters and different ways to make them. How lucky we are we live in modern times and we have internet, we can visit so many great quilting blogs and learn a lot from quilts and quilters. So many new quilting stuff to make and we just want to make each one of them, but at least for me that is not possible, to make them all I must have lots of free time and lots of money. One day I was lucky to read about Journal Quilts, so I read you can make a different blog to try a new quilting idea, pattern or technique at the end of the year you will have 12 blocks and you will learn 12 different techniques or 12 different patterns, that was a good idea. How big should you make each one of those blocks? As for regular quilts, we should follow the instructions every quilter designer has for us so at the end we make the quilt we want to have. For Journal quilts, I don’t think there is an measure that should go for this kind of quilts, from my point of view you can work on a small block or a big block as you want to, everything will depends on your goal. What to do with a Journal Quilt. You can work on your Journal Quilt and at the end of the year you can keep those blocks in a box, when you want to work on a new project and you want to work on a technique you learnt while you did your Journal Quilt, all you need to do it’s to take that block our of the box and you will remember how it should be done. Some quilters, work on their Journal Quilt to make like a book, at the end of the year, you can sew one side of every block to make a book. And some quilters make a quilt from it, they sew together the 12 blocks to make a quilt, it will depend of the size of your blocks to be a small quilt or a big one. At the moment I don’t remember in what year I made it, but I only made 11 blocks and then I placed it in a drawer and I keep it all the time. I think I remember that quilt every day and I knew I had to work on it again. I already have made three Journal Quilts. This is the first one, I started on 2013 and it will be finish this year. On 2014 I made one Journal Quilt about my emotions through the year, this quilt is currently in Puebla, Mexico. 0n 2015 I made a Journal quilt, I work on this one about what I liked about every month, this quilt hangs on one wall here in Canada in my home. On 2016 I made on Journal quilt. This year, I’m working on this quilt, I didn’t want this quilt keep like an eternal UFO. I haven’t quilt much this year, but this journal quilt kept calling me, so before I start to quilt again, I better get that quilt again and finish it. As I looked to the blocks again, I wanted to work a little bit more on some of them and make some changes. Every morning for the last two weeks I have been working on this quilt, you can visit my Facebook page Alejandra’s Quilt Studio to read about it. How I worked on this Journal Quilt. I got inspired by a few great quilters on the internet when I started to work on this Journal Quilt. 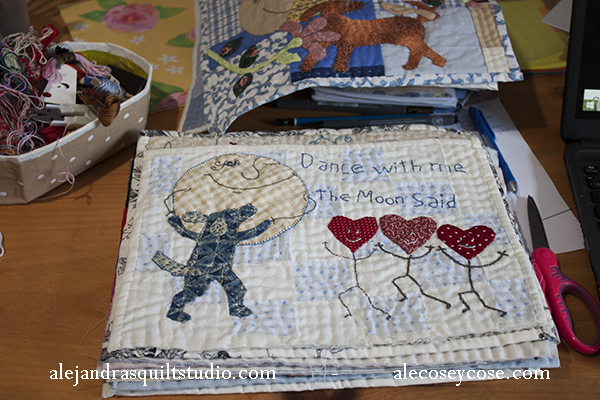 I knew I wanted to do something on my own, so each block will tell a story, I kept a topic on this journal quilt, the moon and a dog. It will be like telling a story, every block a different page, different colors and different stitches. 13 moons in a year. 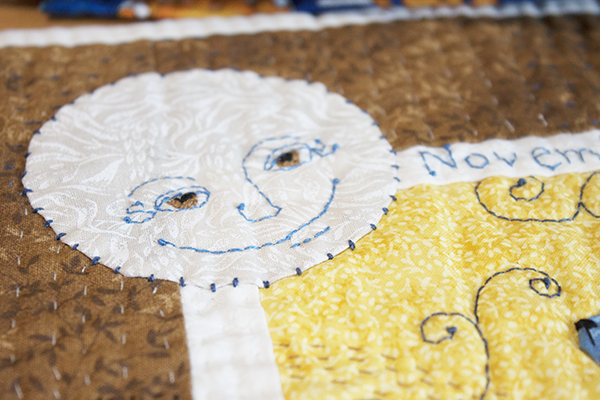 I’m not sure about what year I started to work on this quilt, but I know it was a year with 13 full moons, one month was a blue noon, and one block has two full moons. 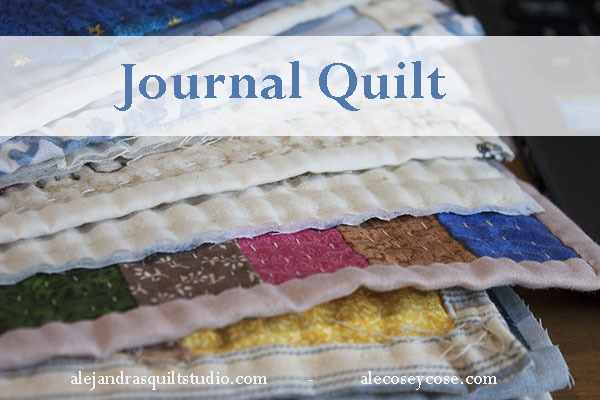 How much do you need to work on your Journal Quilt? As much as you want to, you don’t need to work a lot on a quilt to make it pretty, make it your own way. I will keep working on this quilt until I finish it as I have some plans already for it, I will let you know about it soon. 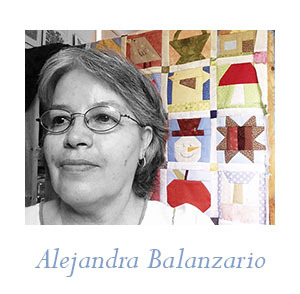 Now you can also follow me on Instagram to see my work on quilts and about my life in Canada.